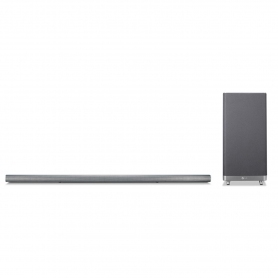 Take your audio experience to the next level with the LAS650M 320 W Soundbar from LG. The LAS650M lets you enjoy audio from your media devices like never before. The 320 W 4.1 channel surround sound allows you to experience your favourite TV shows, films and music in a completely new way. The LAS650M allows you to play high definition sound at 24 bit / 192 kHz, and lets you play FLAC and WAV compressed music files without loss of quality. Audio is crisper and clearer over mid to high frequencies, and the 180 W standalone sub-woofer enhances the depth and richness of the sound. If you close your eyes when listening to live music, you’ll fully believe you’re sitting in the front row at the concert. Your favourite action film will convince you that you’re in a warzone, and listening to your favourite soap will let you believe that the characters are in the room with you. Gone are the days when you had to trail wires all over the living room to obtain a cinematic experience. The LAS650M sub-woofer is wireless, allowing you to enjoy superior sound quality, without the cable clutter. If you have a compatible LG TV, you can connect the two devices wirelessly using Soundsync, eliminating the need for more cables. 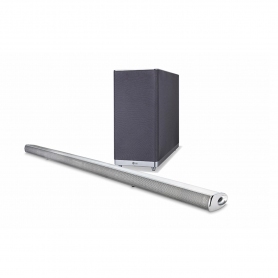 The soundbar is specifically designed for mounting on the wall. This means you can improve your audio, even if space is an issue. Set it up beneath your wall mounted TV and there’s no need to take up space with a TV stand. 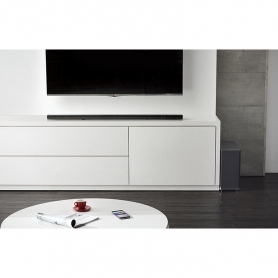 LG have designed the LAS650M to synchronise with LG multi-room speakers around your home. No matter where in the house you go, you can always enjoy great sound. You can also play music straight from your compatible phone or tablet using the soundbar’s inbuilt Wi-Fi connectivity or Bluetooth. 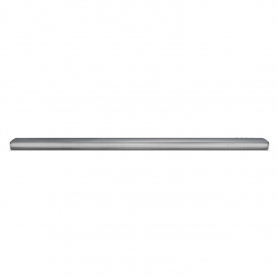 For superior sound with no cables, try the LG LAS650M Soundbar. Order yours today.